Cons: It’s the worst camera in the world for taking black and white (monotone) photographs. The rich-tone monochrome photos take about 5 seconds to process even on the fastest SD card before you can take the next shot and you can’t adjust how much of the filter is used. Your shots look great in black and white until you push the button and the camera turns them into a sketch like image. Where is the setting to just take a black and white (monochrome) image?????? :( I wouldn’t get one of these until the firmware update is released to fix the problem. Sepia was left out of the filter settings. There isn’t a color shift/adjustment setting on the WX30, like on lots of other camera coming out. The camera doesn’t save your settings properly. If you change the height/position of the miniature camera mode, selecting which parts of the image are in focus and blurred in the menu, and turn the camera off then back on again, it forgets the position/height you set, and you have to go through the menu again every time you turn on the camera. Short battery life. The man in the shop said 4 hours recharge or 2 hours if you buy the separate high speed charger. * Maybe I was given a high speed charger with my now broken Sony DSC-T30 (the camera will all the right settings including black and white ;) and sepia). USB 2.0 speed cable connection (*not a problem if you just put your card in a USB 3.0 card reader). Doesn’t have a 1cm macro mode like some of the other Sony cameras. *Update 2011-09-5th: Macro mode doesn’t turn on sometimes. None of the Japanese cameras have English menus and the international models cost more here. If someone is sitting next to you and you take a shot of them with the flash on they get a blast of white light that doesn’t look very nice (auto plus mode…). 2011-10-04th: I tried to take a photo of a dragonfly today and the camera’s macro mode didn’t work properly. I touched the screen where I wanted the camera to focus and everything looked good but when I pushed the shutter button the camera focused on the background and the dragonfly was out of focus. So I looked through all the menus to see if I could just set the camera in macro mode but I couldn’t find anything. After that I went to Bic-camera to ask the Sony staff where the macro settings were. One lady said everything is automatic on the DSC-W30 camera so there aren’t any settings… The lady also said if the colors of objects are similar to the background colors then the macro mode might not turn on automatically… Why didn’t you just add a macro setting to the menu Sony? I hope they release a firmware update soon to fix all these setting problems! 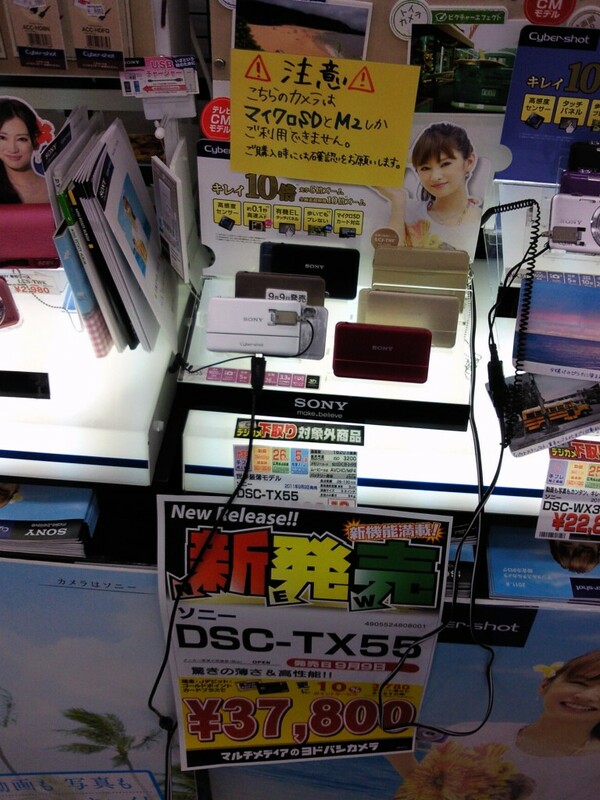 The Sony DCS-WX30 was released and on sale on August 5th, in Japan. 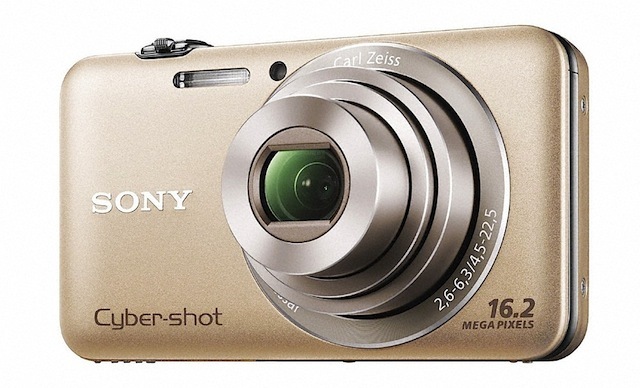 I hope the Sony DSC-TX55 doesn’t have the same problems. Sony is going to do a lot of firmware updates before it releases this digital camera in the shops on September 9th, 2011. *The warning sign just says you might not be able to use some micro SD or M2 cards with this camera. 2011/09/09th: Nothing was changed on the menu of the DSC-TX55. It has the exact same problems… The settings don’t save when you turn off the camera. Macro modes don’t work properly and there isn’t a way just to turn them on. The level of black and white filter can’t be set either. Women with black hair look like they have heaps of gray hairs (oh no). I hope the firmware fix comes out soon. I didn’t have time to check how accurate the OLED was but I will after my trip to Australia.